This example is nothing more than the implementation of the Green Beans: Getting Started with Spring MVC example. It is available from Github in the Simple-Spring-Web-Application directory. This example can be started with the maven tomcat:run goal. For the compare example: http://localhost:8282/baremvc/compare?input1=Pit&input2=pat. 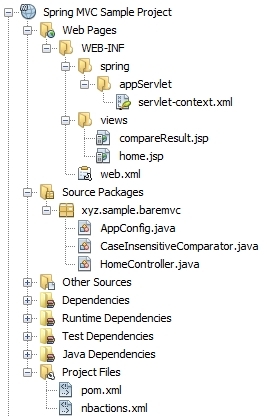 For a demonstration of the Spring 3+ MVC features, there is a complete project described here. It can be started with tomcat:run too.